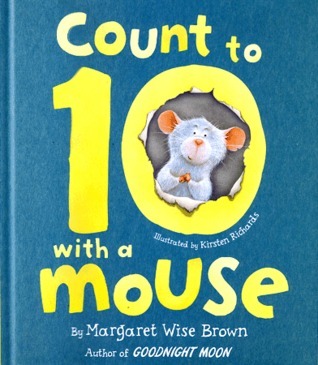 This adorable counting book follows a little mouse as he discovers how to count to ten. He is struggling to count up his fingers and toes, so he goes on an adventure through a hole in the pages of a book, and he finds wondrous things on every page that help him count. He meets fish, butterflies, cats, and crows, and counts them all. The soft illustrations have beautiful detailed lines that show every little whisker and pawprint. The gorgeous colors will appeal to little children as they count up items on each page! The poetry is whimsical and fun, and at the end of each page when the mouse climbs through to the next page, the same poetic line repeats. Toddlers love repetition, so this is the perfect book to read aloud with a child learning to count.